The truck-it-out KYMCO UXV 450i LE Hunter is the hunter green hunting machine with fully built-out features for the ardent adventurer. 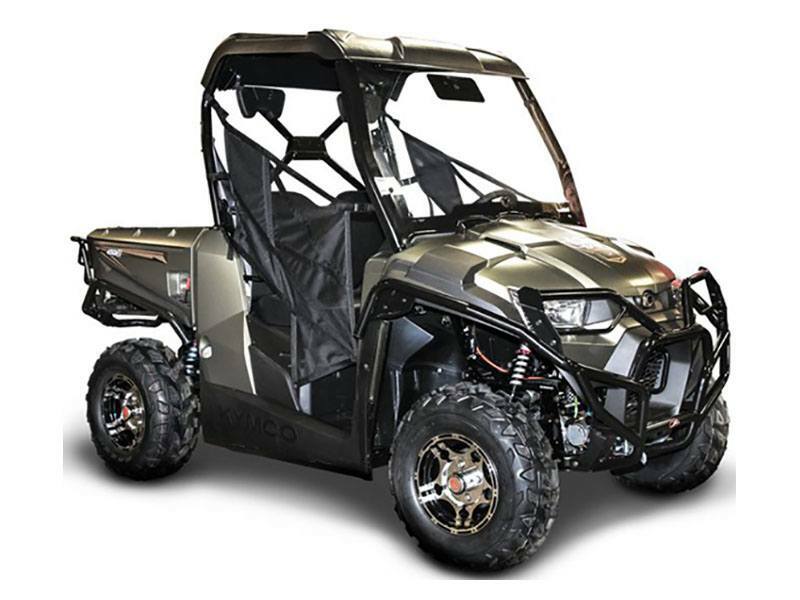 Built on a go-anywhere chassis, the KYMCO UXV 450i Hunter sports special features of: black and silver aluminum 12 in. alloy wheels; factory-Installed 3,000 lb. NuJet winch; hard top; full windshield; Elka Shocks Stage 1; front and rear bumpers; front and rear light guards; front and rear fender guards; and bed extender. This Load-It-and-Go UTV fits into the bed of most full-sized pickup trucks, and has additional standard equipment of; 443cc engine with EFI; bench seat and tilt steering wheel; 440 lb. bed capacity; gas-assist rear dump bed; built–in tailgate storage box; beverage holders; standard 2 in. receiver; shifter gate to securely ensure proper gear selection. The UXV 450i Hunter’s compact chassis wins in rock climbing and dense woods, complemented by a 2WD and 4WD with differential lock.